Guess what happens during Co-operative Show and Tell in Ms Squilley Squirrel’s Year One classroom at Bushland Primary School today. Charlie Chipmunk brings a freshly-chewed apple core that he finds in the grass at the base of a red maple tree. Ms Squilley Squirrel doesn’t see anything interesting in a chewed up, old apple core. But it’s the most exciting thing that’s happened to Charlie Chipmunk this morning and he can’t wait to talk about it – and that’s all that matters. Charlie Chipmunk and Doris Dove choose to share with each other. Often her students choose friends. Ms Squilley Squirrel doesn’t know why Charlie and Doris choose each other, they just go together. And that’s okay. Doris doesn’t bring anything – and that’s okay too – Doris talks about how she likes to sit on a telephone wire at sunrise and coo peacefully. Black-eyed Susan and Black-eyed Sarah sway closer together, petal-to-petal, ready to talk and make black-eye contact. First thing this morning, Susan excitedly tells Ms Squilley Squirrel about a black and yellow bumble bee that visits her yesterday. And now, Susan can’t wait to tell Sarah about it . Hetty House Finch and Chucky Chickadee get ready to turn to each other. Hetty is bursting to tweet about her close encounter with a red-tailed hawk and Chucky is excited about how he flew away fast and escaped the wrath of a Red-breasted Nuthatch at the bird feeder this morning. Lucy, Larry and Lola Leaf make a group of three for their co-operative show and tell because, coincidentally, they all want to talk about their exciting falls to the ground. Canada Geese waddle together and make a group of four. Glenda Goose asks Gloria Goose which way her family will fly as winter approaches. Gloria replies they’ll fly straight south. Gregory Goose chimes in that his family is going to Georgia then Gladys Goose adds that she is heading to Mexico with her cousins. Woolly Bear, who rarely talks in front of the others, is happy to talk when the animals are in small groups. He talks to his friend Golden Woolly Bear about his favourite food, sedum leaves and to his surprise, he learns that Golden Woolly Bear loves sedum leaves too! Some students finish co-operative show and tell. Charlie Chipmunk can’t wait to draw and write about the apple core he had shown Doris. He races to the flower pot and digs up his journal. Soon, everyone is drawing and writing in their journals. Ms Squilley Squirrel calls it Journal time. An e-mail this morning, from a teacher friend in Australia, captures my attention. She alerts me to a request for help from another P-2 teacher. It’s the beginning of term 4 and Yolanda, (not her real name) is running low on ideas and inspiration regarding topics for her children’s talking and sharing times. I want to act immediately, get something out that could be useful right away – a talking/sharing strategy I call Co-operative Show and Tell – and as you’ll see, it’s not the traditional ‘Show and Tell’. 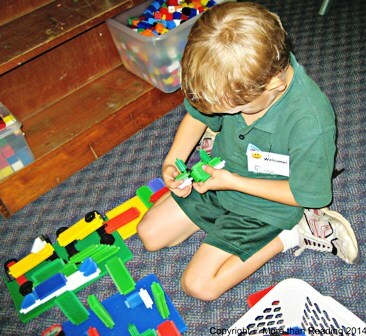 Teachers don’t have to search for topics when children provide a myriad of topics themselves. More interest, and more meaningful sharing, listening and writing for the children. 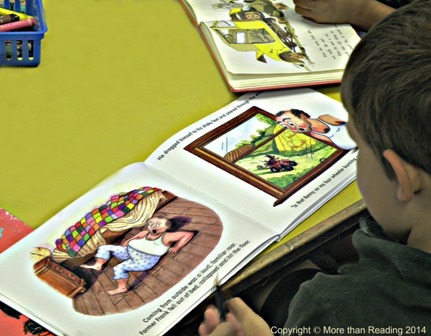 I decide to extract the Co-operative Show and Tell strategy (just two pages) from my book, Teaching Strategies for Literacy in the Early Years and share a free PDF download with Yolanda and interested others. Here is your free download: Enjoy!! P.S. I’ve also updated my website with the free download of Co-operative Show and Tell. P.P.S. 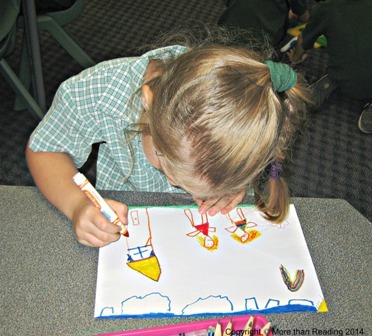 Click here for more about Co-operative Show and Tell as a valuable pre-writing time. (An article I wrote for Practically Primary, 2010 and later wrote as a blog called ‘Please don’t ask me…’). Creating a nature photo story An April Alphabet got me thinking. Since being on leave, I’ve had the luxury of more time to explore my natural surrounds–to walk and wander on nearby beaches, fields, forests and trails–and to become more aware of letters (and numbers) in nature. I’m reminded of the times children brought in a curled up witchetty grub that looked like an ‘o’, a caterpillar lying straight on a leaf that looked like an ‘l’ and a stick in the shape of a ‘t’. Finding letters in nature is a fun way for children to learn the look, names and sounds of letters. Some letters seem to appear more often than others, such as c, j, l, o, t, v and y. And I wonder why? What are some of the letters made of? What letters or numbers have you seen in your natural environment? Holidays have a curious habit of flying by. It seems like only yesterday I was writing about loading my bags on the early morning shuttle to the airport. In the blink of an eye, it’s back to school – October 3rd, the first day of the last term. Reality hits home. There’s an initial reluctance in starting work. I push aside fleeting thoughts of just one more week! There’s no gradual transition, no time to ease in gently. The first child arrives and I’m into it. Monday. Professional Development for teachers. We collaborate on aspects of reading, spelling and explicit teaching. Tuesday. A significant milestone for the children, their parents and me – Year One students return for their last term. In just ten weeks they will finish and head into Christmas holidays, then Year Two in February, 2012. 8:15 AM. The first children trickle in. They come into my room early—it’s an important part of our day when children and parents have opportunities to interact and share informally—I call it a ‘staggered start’. It’s even more important the first day of term to make sure the children have extra time to talk and share about events and experiences of their past two weeks. The children’s energy and enthusiasm is contagious, it renews me. This is the best way I know to make an effective transition from holiday to work mode. Cobwebs clear, gears click back into motion, the passion returns. Bounding up the stairs, Terry calls from the doorway, “Good morning Mrs Swan.” He walks over and stops before me… as if to give me a hug. “Good morning Terry. 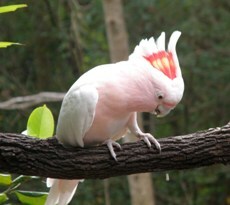 Hey, you look terrific with that new haircut. How were your holidays?” Words gush out excitedly as he recounts his stay in a nearby resort. Striding in, Donny greets me with his big, wide grin. I compliment him on his sporty new haircut that suits him so well. He seems taller. Has he grown in the two weeks away? Quietly entering the room, Zack whispers, “Good morning.” I comment on his new, bright-white and red running shoes – adding that I got new running shoes on the holidays too. More children and parents come in and mill around, asking about holidays and chatting happily with all and sundry. It’s wonderful to see everyone again. 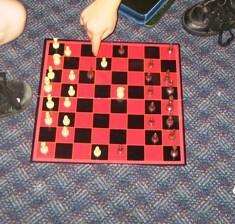 Several boys come in with new games and proceed to show their friends how to play Chess and Uno. Two crickets arrive. In a plastic container carried by Kerrie. 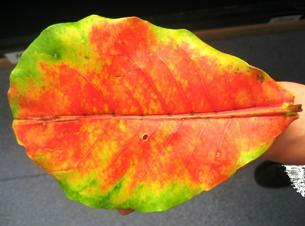 A shiny, colourful leaf appears. Misty found it on her walk to school. Adults and children admire nature’s contributions. 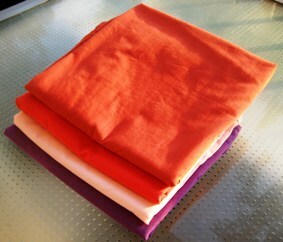 ...and I bring in freshly-washed covers for the reading cushions! Esther walks in quietly, smiling and firmly gripping an exercise book in her hands. “This is my journal about my holidays,” she says happily. Later, Annie and Esther read their journal entries to the class: family trips, outings and holidays. Other children chime in and discuss their holiday activities – camping, fishing, ice-skating, movies, swimming in resort and home pools, riding bikes, building sandcastles and going to Grandma’s. 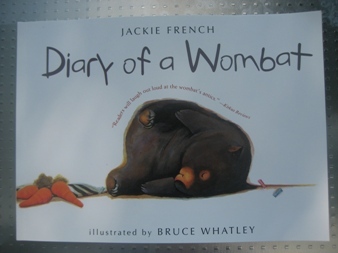 Molly thinks Esther's journal sounds like the writing in 'Diary of a Wombat'. Visualising. Before moving to their writing I ask the children to visualise what they are going to write about and to put possible sentences in their heads. I remind them to think about adjectives they could use to describe objects, places or events and words to tell how they feel. Finally, I add Natalie Goldberg’s advice: Be specific! Not car, but cadillac. Not tree, but sycamore. ‘It is much better to say “the geranium in the window” than “the flower in the window.” “Geranium” – that one word gives us a much more specific picture… It immediately gives us the scene by the window—red petals, green circular leaves, all straining toward sunlight’ (Goldberg, 1986, p 77). It’s great to be back. 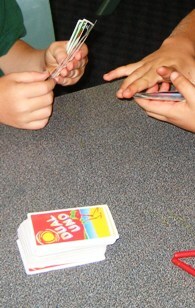 Children help each other with ideas, words, spelling. There’s quality writing from all. One of the children writes a seven page story in her journal. I realise how far their writing has come since starting the year in February and I can’t wait to see how far they can go by the end of the year. Harry is the first to arrive. Then Jack and Rowena. Jack’s mum says he’s been awake since 5:30. “We can’t be late,” he says. ” The bus leaves at 9.” More excited Year 1s come to the classroom as they arrive at school. They wear school uniforms, including closed shoes and hats. Lunches and drinks in plastic bags are placed in the plastic tub according to the adult who will care for that group of five children on our class trip today. We are going to the Tropical Zoo. This is part of our unit of work on Australian Animals. Individual ‘studies’ of a self-selected animal and a ‘What am I?’ writing task are well underway. Paintings of animal habitats are awaiting animals. Seeing live animals at the zoo is special. And… off we go on the bus! Past houses, shops and shopping centres. Past creeks, cane fields and paddocks of playful horses. We go over bridges, through roundabouts and on highways until we reach the zoo. 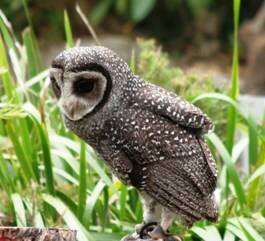 We leave the containers of lunches at the large undercover picnic area then head up the hill to the Bird Show. A young zoo worker provides an informative and humorous commentary as we see the birds: a quiet lesser sooty owl, a beautiful Major Mitchell cockatoo, a black and red cockatoo, a sulpher-crested cockatoo, a cheeky magpie that puts a tissue paper into a bin, a barking owl and a serious white sea eagle – spectacular! PS How long did it take a zoo worker to train the magpie to put paper into the bin? 3 days? 3 months? 1 day? 50 minutes? 20 minutes? 1 hour? 4 hours? Next, we go to the kangaroos and then to the crocodiles. Unexpectedly, we see zoo workers moving a large crocodile. 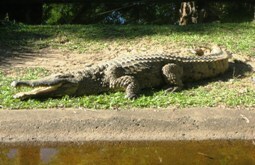 The crocodile’s snout is bound with rope and about ten strong handlers hold him. It looks like hard work… We move on to see crocodiles warming up in the sun and an occasional crocodile opening its mouth to cool down. Other crocs keep cool under water. Is the crocodile opening its mouth to keep cool? After lunch, the adults and small groups of children walk through the zoo. We see three striped lemurs, a red panda, a well-fed dingo, a resting wombat, a pacing cassowary, numerous sleeping koalas, several long, sleek snakes, green tree frogs, American alligators, eastern water dragons, a blue-tongue lizard, a glorious iguana and dozens of colourul birds. We read the notices giving us information about the animals. We all learn lots! It is a wonderful walk… and slowly we head back to the bus for the return to school. Tomorrow the children will talk, draw and write about the trip as we re-live the real-life experience. What excursions does your class take out of school? 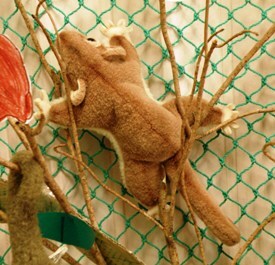 A branch stands in a bucket and sticks, leaves and gumnuts litter the floor in the ‘bushland’ area of the classroom. 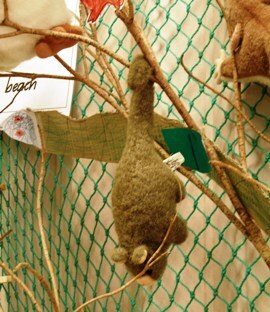 A koala, kookaburra, ring-tailed possum and sugar glider sit and hang in the branches. 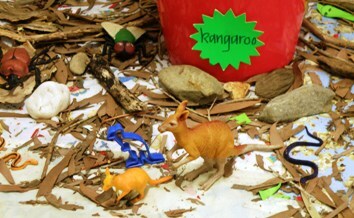 Kangaroos are on the ‘ground’ along with assorted snakes, ants and insects. 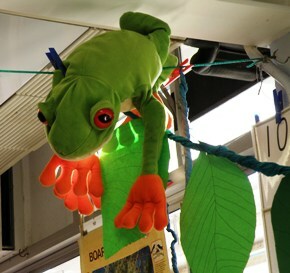 By the windows, a green tree frog sits on the rafters looking down at the hanging vines, sand, ‘mangroves’ and crocodiles who live in the ‘crocodile habitat’ below. The geographical areas and animals reflect our unit of work this term: Australian Animals. 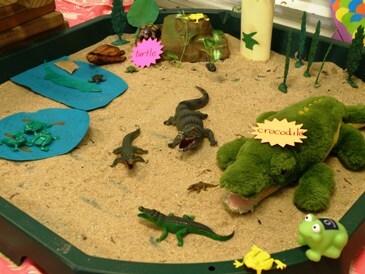 Crocodile habitat – with turtles and frogs in the mix. really hungry crocodiles will eat bats? 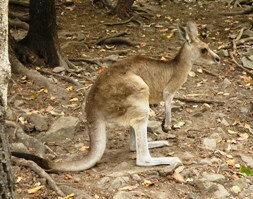 most kangaroos can only move both back legs together and not one at a time? green ants can carry up to 20 times their weight? wombats have backward-facing pouches so dirt does not get over the young as wombats dig? 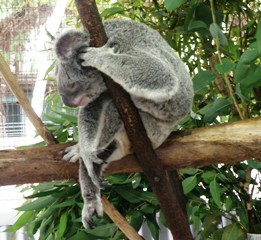 koalas sleep about 75% of their time? How are your units of work refelcted in your classroom? Chloe’s mum came into school today carrying a dark, dark box. And in that dark, dark box was a soft, white towel. And in that soft, white towel was a soft, black towel. And in that soft, black towel was a hard, white skull … of a crocodylus johnstoni. 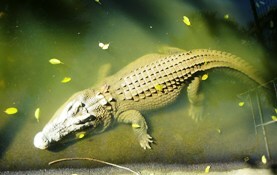 A freshwater crocodile. 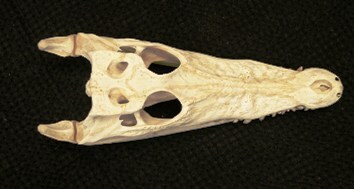 A crocodile head. "Look at the eye holes." Crocodylus, what big eyes you have on the top of your head. All the better to see you with (when I am largely submerged in the murky water). Crocodylus, what big nostrils you have on the top of your head. All the better to breathe with (as I remain still, like a log in the water). Crocodylus, what sharp teeth you have in that long, tapering snout. All the better to grab you with and swallow you whole, my dear! "Look at the sharp teeth and how they fit together." There’s a crocodile in the next room too so I borrow it to show the children. 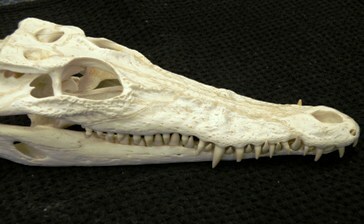 It’s a young crocodylus johnstoni prepared by a taxidermist. We look closely and see the five toes on the front feet and the four webbed toes on the back feet. We observe two lines of spikes along its back that become one line of spikes along the tapering tail. Children comment on the browns and blacks of the hard scaly body and the ‘glassy’ appearance of the eyes. “I feel like it’s watching me all the time,” said Thea. "Look at the four toes on the back feet." Later we move on to Internet information and detailed big books with wonderfully clear photographs. 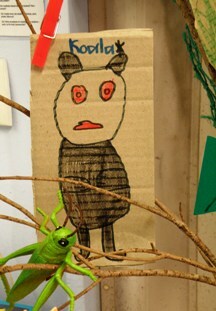 The children draw and label their crocodile pictures. Today, we learned lots about crocodylus johnstoni… and it was fun. 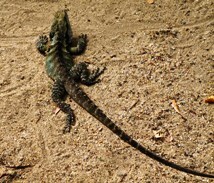 I am cold-blooded so I warm up by basking in the sun. Have you seen crocodiles in the wild? Or in a zoo? 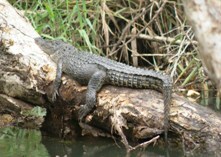 What more can you share about freshwater crocodiles?